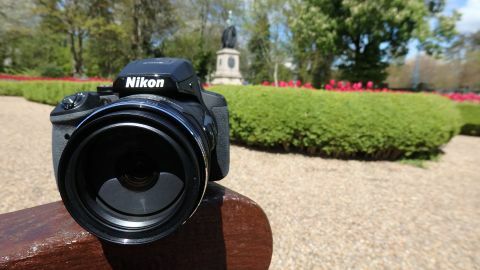 Nikon's P900 currently leads the market for optical zoom range, with its 83x ratio equating to 24-2000mm in 35mm terms. Nikon claims this allows you to see things not visible to the human eye - such as details on the surface of the moon. There's also a digital zoom, which boosts that reach to 166x, or 4000mm. A major issue with long zooms is image blur at the longest end of the zoom range, as the effects of camera shake are exaggerated. Nikon's solution is to include its latest Dual Detect Optical VR system, which it claims offers a 5-stop shutter speed advantage. The P900 has the same 1/2.3-inch, 16 million-pixel sensor as Nikon's slightly cheaper P610 bridge camera. That's the same size sensor as in many compact cameras – and, despite appearances, the P900 is classed as a compact camera because the lens is fixed, not because the camera is small! Even with the 83x zoom retracted (left) the P900 is a big camera; with the lens extended to its maximum (right) it's a monster. The P900 has a fully articulating, 3-inch, 921k-dot screen, although Nikon has chosen not to go down the touch-sensitive route. This is complemented by a 921k-dot electronic viewfinder which has a eye sensor for activating and deactivating it automatically. Round the back, there's an articulating screen and electronic viewfinder. Nikon appears keen to include Wi-Fi and NFC in as many of its products as possible, and the P900 is no exception. A free app, available from the Apple and Google Play stores, enables you to remotely control the camera from your smartphone or tablet, or to download images you've already taken. GPS is also built-in, for those who like to geotag their images. Another problem associated with compact cameras is shutter lag – the delay between you pressing the shutter button and the picture being taken, as the camera autofocuses; to counter this the P900 features 'rapid AF', which promises responses of approximately 0.12 seconds at the wide-angle end of the lens. Full manual control is available, along with a range of automatic, semi-automatic (aperture priority and shutter priority) and scene modes. However, Nikon has chosen not to include raw format shooting - which seems a bit remiss for a camera at this price point, and given the intended audience. The P900 can only capture JPEG images (Normal or Fine quality). A range of digital effects can be applied to images, either at the time of shooting or in playback mode. To complement its ability to record full HD (1080p) video, the P900 has a built-in directional microphone which adapts to the zoom setting; however, there's no port for plugging in an external device. You can also create time-lapse movies. The P900 is no lightweight, tipping the scales at a hefty 899g, which is about as much as the average DSLR and kit lens – although you get a much more greater zoom range than the average kit lens, of course. Battery life is quoted at around 360 shots, which is reasonable for a compact camera, and should be enough for a day of fairly heavy usage. Right now, no other bridge camera comes close to offering the same kind of focal range as the P900, although some rivals come close, such as the Canon SX60, which offers a 65x optical zoom, and the Sony HX400V, which offers a 50x optical zoom. Of this trio, only the Canon offers raw format shooting.